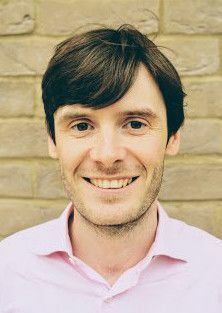 Gearoid O Faolean did his Phd on support in the Republic of Ireland for the Provisional IRA. 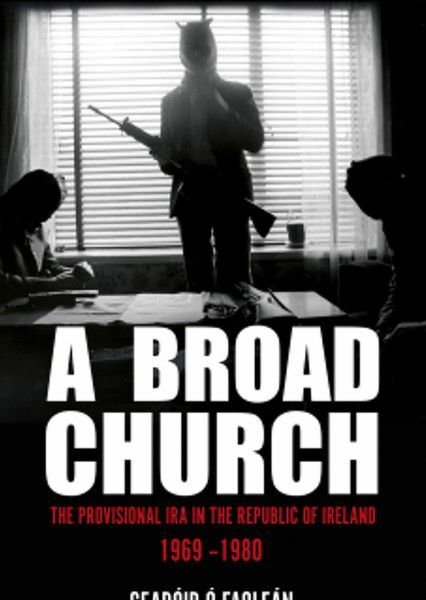 His new book ‘A Broad Church’ is based on much of his thesis. The IRA could not have survived so long – claiming almost 1,800 lives – without persisting support from the Republic, he says. The most surprising aspect of his Phd was his finding that – contrary to common perception – the IRA was not mainly funded from the US, but actually from the Republic. Government action – Successive Dublin governments struggled to maintain cooperation with British counterparts whilst appeasing nationalist sentiment. Taoiseach Jack Lynch told a British ambassador that certain named Irish judges were being “bad” or “weak” on the IRA. 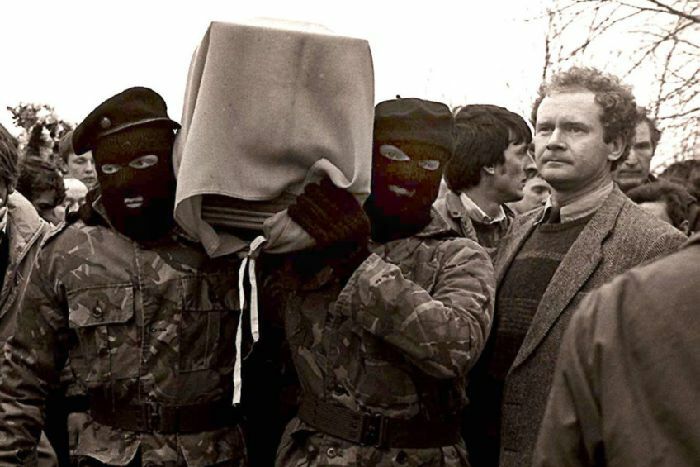 Support – Members of all major political parties in the Republic provided active IRA support in the 1970s. The illegal 1973 IRA booklet, Freedom Struggle, was published in Drogheda by somebody referred to by the government as ‘a prominent Fianna Fáil member’. Four Irish soldier were convicted of stealing explosives from McGee Barracks in 1974; a Garda passed police documents to republicans after Bloody Sunday and a civil servant was charged with passing files to the IRA in 1975. Training – From 1971, hundreds of IRA volunteers passed through training camps but less than twenty were ever prosecuted. 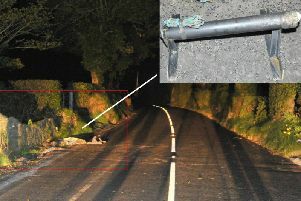 Once inn rural Munster, IRA volunteers reportedly went down to the local village for cigarettes armed and in full uniform without fear of Garda. Arming – Shannon Airport and Cork and Cobh harbours were used extensively by the IRA for arms importation during the early 1970s aided by sympathetic workers on-site. The GAA – the 1974 annual congress unanimously voted to campaign for the reinstatement of civil servant Donal Whelan who was sacked after being convicted of attempting to smuggle five tons of weaponry. Members of the Wm Strain Wm Lightbody Memorial Flute Band, Newtownards presentating a football autographed by the Rangers FC team to young Adam at the REACH UK offices, Newtownards Road, Belfast. 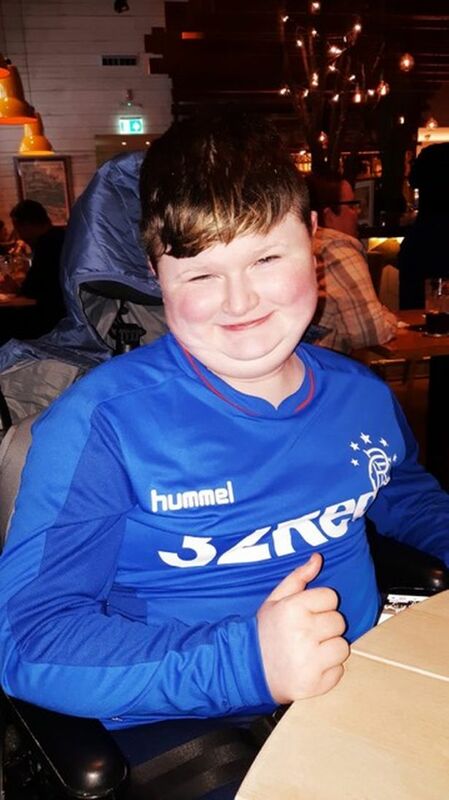 As told in previous articles, Adam is an enthusiastic Rangers supporter and is confined to a wheel chair because of his degenerative muscle wasting disorder. A brilliant gesture by the band. “On Wednesday March 27th, members of the community in East Belfast came together in the Reach UK office on the Newtownards Road to mark the retirement of one of its local heroes, Dr John Kyle. As an individual of the community, Roy Stewart presented a framed artefact from the Somme to Dr Kyle to open the proceedings and after some short speeches, Jim Wilson, Chair of Reach UK, then presented a cut glass award engraved with the title “Community Champion “ from the Reach UK Project, community development group. 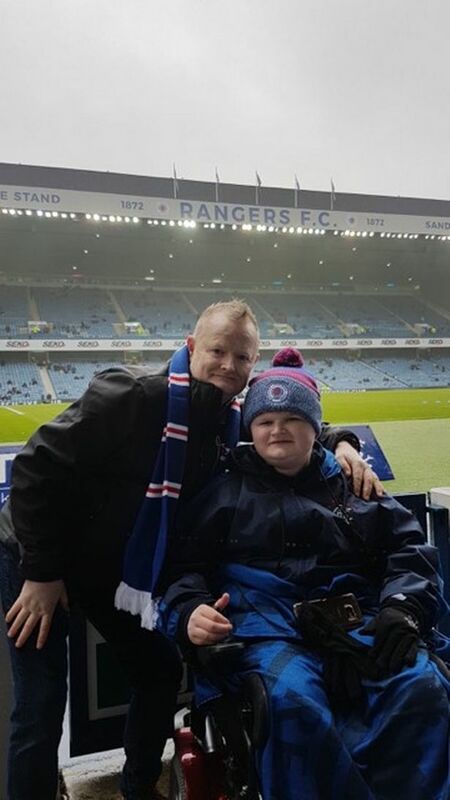 An East Belfast dad has told how a surprise trip to see Rangers funded by the community ‘turned on a light’ in his ill son. Adam Stevenson, 14, has Duchenne Muscular Dystrophy. The Belvoir estate lad is wheelchair-bound due to the muscle-wasting condition that has limited his life expectancy to his mid-20s. The community in East Belfast raised money to take Adam and his family to see Rangers V Kilmarnock at the weekend. Adam was joined by dad Gary, mum Beverley and brother Jake as they got a behind-the-scenes look at the training ground with Rangers legend Mark Hateley. Gary, 53, told Belfast Live: “We’ve been on holiday before to Spain and we’ve been to Florida but this Rangers trip has just turned another light on for Adam. There’s just another level in his life that’s that’s just lit up that we didn’t think was there. Donations towards the trip came from R.E.A.C.H, East Belfast Action for Community Transformation (ACT), Rangers supporters clubs from HW Welders, East Belfast Constitutional Club and Lagan Village along with the Union Jack Shop and East Belfast Protestant Boys Flute Band. The game finished 1-1 but it was a trip the family won’t forget. Gary said: “We were a good hour and a half at the training ground, watching the players train. “We met up with Morales which was incredible, we met all the staff and the two boys were just gobsmacked. “Mark Hateley bent over backwards for us, he was like a family member and everything we wanted to see he showed us. “The game itself was poor but at the same time just being there for Adam and Jake and seeing the crowds was outstanding. “They couldn’t take it in. They’re still gob smacked, they couldn’t believe the size of the crowds. “I don’t know what it was – they must have read the article on Belfast Live – because they were coming up and saying: “You’re the family from Belfast”. Everyone had the thumbs up – we were totally taken aback. “And then people who did know us were saying how great it was to have us over. Friends of the family are hosting an event at East Belfast Working Men’s Club on Friday night from 8pm to raise money for Adam. Entry is £3. Can you help? Do you know anyone who fits the criteria below? “I am currently Working as a Production Trainee with Double Band Films based in Belfast. We are doing some work on a proposal for BBC NI the details of which I have included bellow. Any help you or your members could offer would be greatly appreciated and any further questions or suggestions you may have can be answered by replying to this e-mail or contacting me at the number bellow or via my mobile 07849961686. DoubleBand Films are a Belfast-based documentary production company who make factual programmes for BBCNI, BBC4, and C4. Some of our recent productions include Dan Cruickshank’s Monuments to Remembrance (BBC4); Britain’s Ancient Tracks with Tony Robinson (C4), and Road, the story of the Dunlop road racing family (BBCNI). The company are also a key producer of Ulster-Scots programmes for BBCNI, and have made successful and popular series such as Brave New World, with William Crawley, and The Band, a current series exploring the world of marching bands. We are presently developing a new programme on the subject of migration between Ulster and Scotland, that would involve a teenage girl (over 18) from Northern Ireland embarking on a journey where she would explore her Scottish ancestry, in the company of a fellow young migrant living in Scotland. In the course of the programme, our young contributor would discover the experience of her ancestors, who made the perilous journey from Scotland to Ulster in the late 1600s, and exploring the reasons why they left. In following in her ancestors footsteps, she’ll also find out what the Ulster landscape would have been like at that time, and discover how Scots migrants created settlements, and made new lives for themselves. In experiencing and recreating life in late 17th Century, the programme would also see our young contributor, along with her Scottish counterpart, try their hands at activities that her ancestor would have relied on, and with the help of heritage experts they will work with animals, and create typical meals made by the settlers. We are looking for a girl in her late teens (over 18), from an Ulster-Scots family in Northern Ireland, who would be interested in taking part in this unique project for BBCNI. They or their family do not need to be in the full knowledge of their family history, as we will be engaging with the Ulster Historical Foundation, who will assist us in the genealogical research. 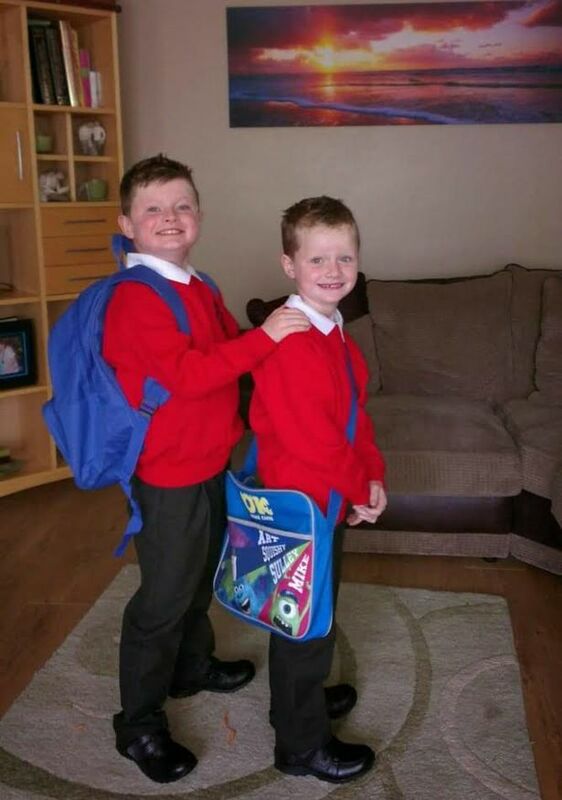 As one of just 65 people in Northern Ireland with a rare, life-limiting condition, Adam Stevenson’s parents know that his life will be short. But the East Belfast family is determined to make his days memorable. This weekend he will visit his heroes at Rangers FC after the community came together to raise the money. 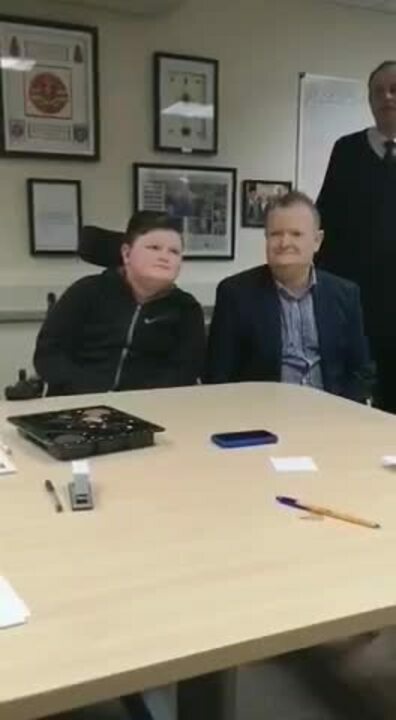 The 14-year-old from the Belvoir estate has Duchenne Muscular Dystrophy, a muscle-wasting condition that limits his life expectancy to his mid-20s. 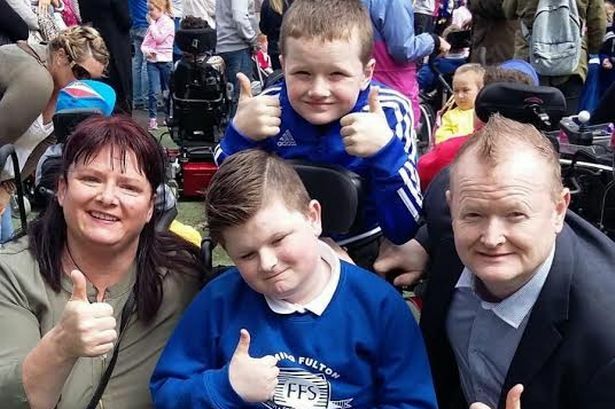 Adam, who is wheelchair-bound, lives with his younger brother Jake, 12, mum Beverley, 48, and dad Gary, 53. He is especially close with Jake. Gary added: “They’re right close to each other. If Adam drops anything he would go in and lift it for him. “They love each other – and fight like normal brothers. Adam’s condition continues to get worse and his family is determined to fulfill a number of his dreams. Gary said: “It’s getting worse every day. All his muscles are dying. His heart is dying. There is no cure and there is nothing we can do – we’re just at our wit’s end. “We know the next 10 years aren’t going to be nice. 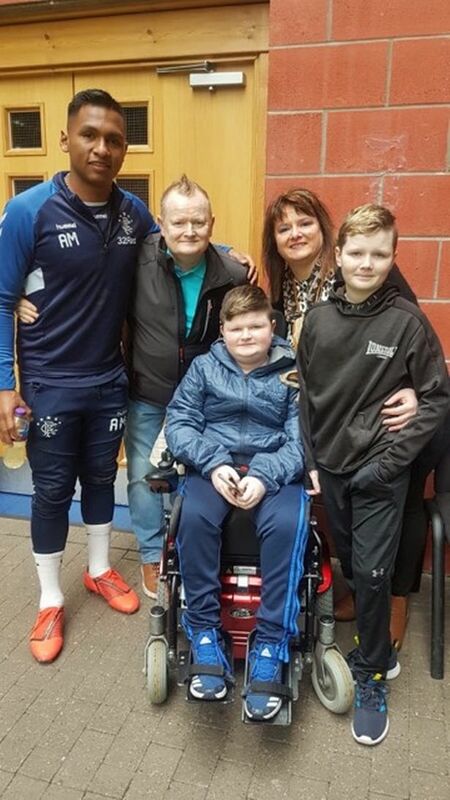 The family was approached by Jim Wilson from R.E.A.C.H and the wheels were put in motion for a dream trip to see Rangers v Kilmarnock on Saturday. Gary added: “Up to two weeks ago, we knew nothing. A family member was approached by Jim Wilson who asked if there was anything he could do. “Jim got all the community involved and he has made one of his dreams come true. “The clubs throughout East Belfast that have helped are brilliant – it’s come as such a big surprise. “To get to see Rangers, to meet the players – it’s like Christmas Eve. We can’t thank enough those who have been involved in making this happen. “His excitement is beyond words, he’s overwhelmed and we’re so happy that we have this opportunity. R.E.A.C.H Chairman Jim Wilson said: “I’d like to personally thank the groups who came together to raise over £1000 to make this possible along with the staff at Stena Line. Matthew Bannister on our friend and patron Ian Adamson OBE.